If you're a regular Google 3D Warehouse user, you have may noticed a few changes today. We launched some new features and other fixes. 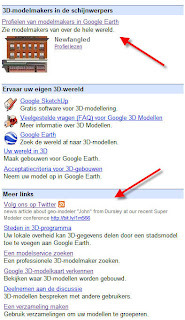 One of the most visible (and coolest) features is the new RSS reader that Mark posted. If you have a favorite modeler and would like to keep tabs on when they're publishing new models, you'll want to give this a try. For the moment, this feature is only available in English, however, we hope to make it available in more languages in the not too distant future. The right-hand panel now has a new area where we highlight featured geo-modelers. It also will show a real-time feed to our 3D Warehouse Twitter account. While the right-hand panel updates are largely cosmetic, the "tell us why we're wrong" link is very practical. If you've had a model that you feel that we have incorrectly judged (and we do make mistakes!) use this link to alert us to it. 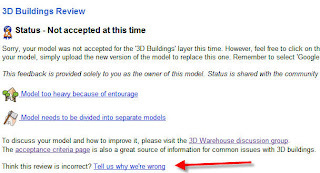 The "Tell us why we're wrong" link is located at the bottom of your model detail page as shown below. We hope you enjoy these new enhancements. Happy Sketching! The feed is very nifty indeed, thank you!